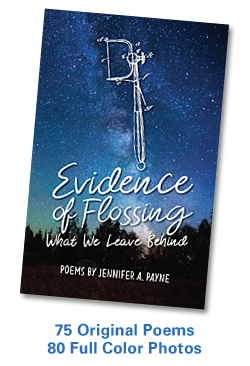 SATURDAY, JANUARY 26 • 6:00 p.m.
On Saturday, January 26, the New Haven Bioregional Group will host author and naturalist Jen Payne for a poetry reading and book signing featuring her book Evidence of Flossing: What We Leave Behind. The event, held at the First Unitarian Universalist Society of New Haven (608 Whitney Avenue, New Haven), begins with a potluck supper at 6PM, followed by the reading at 7PM. Evidence of Flossing: What We Leave Behind follows on the heels of Payne’s 2014 well-received book LOOK UP! Musings on the Nature of Mindfulness, and continues a dialogue about our innate connection with nature. Both books will be available at the event, which is free and open to the public. Jen Payne enjoys writing about our relationships with each other, with our natural world, and with our innate creativity. Installations of her poetry were featured in exhibitions at the Arts Council of Greater New Haven and Kehler Liddell Gallery (New Haven), and her work has been published by The Aurorean, Six Sentences, the Story Circle Network, WOW! Women on Writing, and The Perch, a publication by the Yale Program for Recovery & Community Health. Jen is a member of the Guilford Poets Guild and the Connecticut Poetry Society. You can find more of her work on her blog Random Acts of Writing, www.randomactsofwriting.net. Connecting New Haveners to their life place, the New Haven Bioregional Group sponsors walks, films, canoe trips, potlucks, and other events to help us connect with our natural and built environment, and to build community and local resilience. For more information about this event and others, please visit www.newhavenbioregionalgroup.org. This entry was posted in Books, Nature, Poetry, Spiritual Ecology, Spirituality, Writing and tagged Connecticut, Nature, New Haven Bioregional Group, Poetry, Spiritual Ecology, Spirituality. Bookmark the permalink.